The document pictured below is from the Ernest Hemingway Collection at the John F. Kennedy Presidential Library. We think it may be a rebus or another type of pictogram that uses pictures to represent words, parts of words, or phrases. Can you help us solve this puzzle? The dates specifically mentioned on the documents are September 21, 22, 24, and 25. Luckily, whoever created this document also included the day of the week (i.e., Saturday, September 21). Using a handy historical calendar, we were able to determine the year to be 1918. We think that the document depicts a scene that took place shortly after Hemingway’s time as an American Red Cross (ARC) ambulance driver in Italy in June and July of 1918. Hemingway was assigned to ARC Section Four along with William Horne, Howie Jenkins, and Theodore Brumback (Baker 41). Based on nicknames Hemingway used for these friends in his correspondence, we suspect they appear in this document as Bill, Jenks, and Brummy, respectively. Around midnight on July 8, 1918, Hemingway was severely injured by an exploding canister while delivering “a supply of cigarettes, chocolate, and postcards for the soldiers” (Baker 44). Hemingway recovered in a hospital in Milan, where he fell in love with a nurse named Agnes Hannah von Kurowsky, the model for Catherine Barkley in A Farewell to Arms. In late September 1918, Hemingway was healthy enough to go on holiday to the Gran Hotel Stresa on Lago Maggiore with his companion Johnny Miller, ARC ambulance driver for Sections Two and Three (Baker 51). Based on the drawing of the envelope with their nicknames, it is possible that Bill Horne, Theodore Brumback, and Howie Jenkins drew this puzzle about their Red Cross activities to send to Hemingway while he was in the hospital. Bill Horne had also been recuperating in the hospital alongside Hemingway for three weeks in August 1918 (Baker 48). What do you think about this possibility? Who do you think created the document? 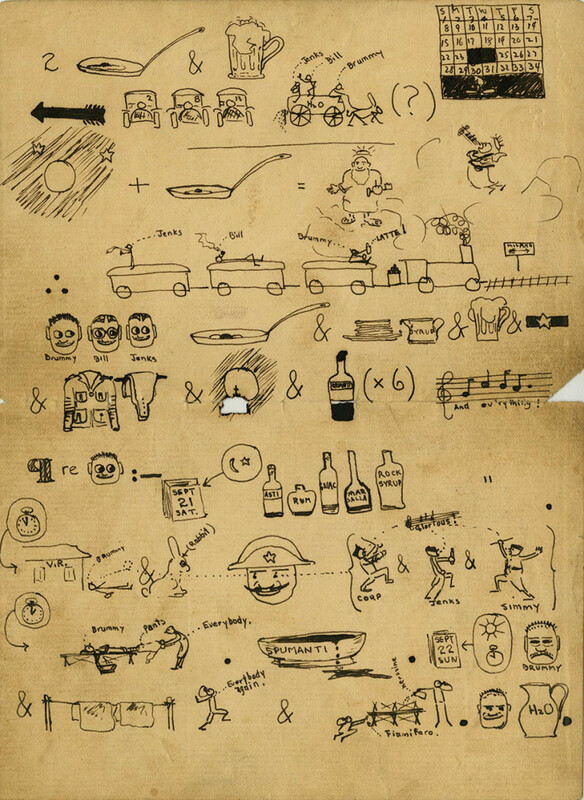 Do you recognize the people and scenes depicted in the document? And can you tell us how you know that? Our cap, Bates probably refers to Captain Robert W. Bates. He was Field Inspector of Ambulances for the American Red Cross (Baker 48). Do you agree? Jimmy probably refers to Jim Gamble. He was American Red Cross Inspector of Rolling Canteens (Baker 48). Do you agree? The document is composed of three one-sided pages with no page numbers. Do you think the above images represent the original order of the document? Why or why not? Do you know what the following terms mean? We appreciate your help describing this exciting Hemingway document. Enjoy! “Historical Calendar.” Miscellany: Miscellaneous Technical Articles by AR Collins. ARC.id.au. Web. 14 May 2012. <http://www.arc.id.au/Calendar.html>. “Spumanti” refers to “Asti Spumanti,” the Italian sparkly wine. W.K is probably abbreviation to “Well Known” (typical in Hemingway’s letters. “Corp” is Carleton Shaw. “Barney” is Lawrence Barnett. Henry is probably Henry Villard. That’s all I can figure out. The Hemingway Collection at the JFK is aware that some of you have had difficulty posting to our Archivally Speaking Blog. We think the issues are resolved. One step we have taken is to change the color of the Captcha box so that it is clearer to use. If you have concerns with the quality of the image or experience difficulties leaving comments on the blog, please contact our Director of Web Technology, Christopher Reichert at christopher.reichert@jfklfoundation.org with a copy to me susan.wrynn@nara.gov. Here is a compilation of the comments that have been made on The Hemingway Society’s Hemingway listserv. And the frying pans all look like they have eggs in them. 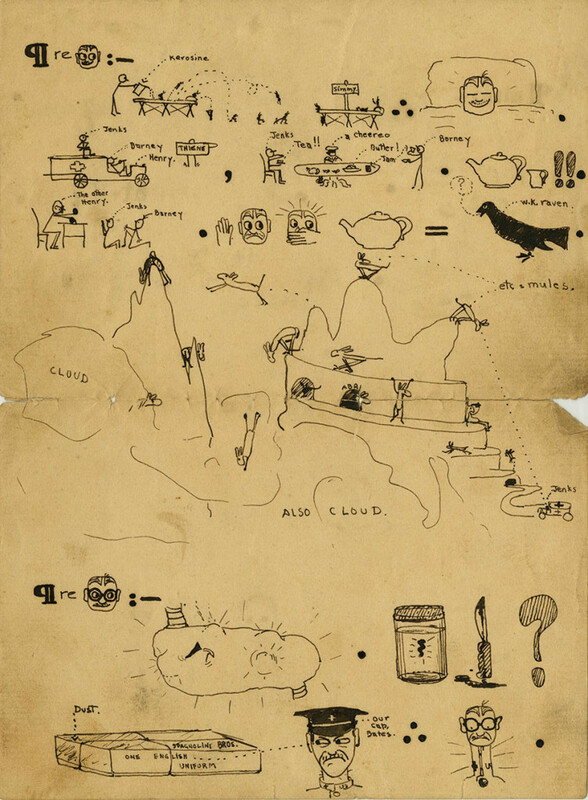 I can make out “Attack” “throwing the bull” and “Aguers well” in the third picotgram, about half way down on the right. There are several occurances of what looks line a frying pan, “&” and a mug of beer. You know your tools better than I do, Peter! Augurs indeed! I was able to “save picture as” and then go into photos and enlarge each of them which helps. I wish I could make out some of the words but they become blurry. I just kept clicking on the pictures until they got bigger. I also made out the at + drawing of a tack as “attack.” Very good on the others, Peter and David. I also cannot read the words on the pictogram. We need a better photo sent with an e-mail. “spumanti” possibly is spumante or sparkling wine. “fiamifaro” probably should be spelled fiammifero and would be a wooden match (I think). Either Henry or the “other Henry” might be Henry Villard. I was hoping that it was a message that was also a play on something else. For a minute I was thinking of a pastiche on the poem Gunga Din, but no. Maybe another, similer work? It’s quite difficult to work with the copy that I have — can’t make out the different items or read the words. Perhaps the first item is a sign for paragraph. If this is correct, it appears that the letter is divided into four parts, each being a paragraph. The first paragraph on page one would be about the guy drawn after “Paragraph re (regarding)” and is about 2/3 of page one. The second paragraph, regardingt the second guy, is the last page of page one and first half of page two. The third paragraph regarding the third guy is the last half of page two plus the first line of page three. The fourth paragraph is “regarding” whatever is written after the word “re”. One part of the letter seems to have two mountain tops above the clouds. The right mountain seems to have an ambulance starting up a road winding up the mountain. Some type of small animals are on the road or jumping from the mountain. I find it impossible to work on the pictogram without a much better copy. Even with a better copy, it appears that it will not be easy to solve. Your start on throwing the bull and augers well seems to be right on. I just keep clicking on the pictures until they get bigger. What I can’t do is post a comment to that site. Any tips on that? The top of page two and the bottom of page 3 both have the frying pan and the beer mug with an ampersand between them. Fry and Stein? Frankenstein? What you’ve said about the paragraph symbols is convincing. There are a lot of big dots: are they periods? I was looking at that one as well. I’m probably being way too literal, but I thought the pan and brew were what, back in college, we called the Breakfast of Champions–basically, breakfast with a lot of beer and usually consumed on Saturday morning prior to the tailgating party prior to the football game prior to the post-game parties, which leads to the hangovers acts of contrition that might be the sets of drawings following that first breakfast. I meant to add that the “Barney” mentioned might possibly be a nickname for Lowry Barnett, one of the ARC ambulance drivers from the Chicago area. Correction: the name apparently is Lawrence “Larry” Barnett (in Carlos Baker’s Hem. biography), not Lowry Barnett. Barnett went on a fishing trip with Hem and others after the war (Baker). The order the pages are in makes sense to me! 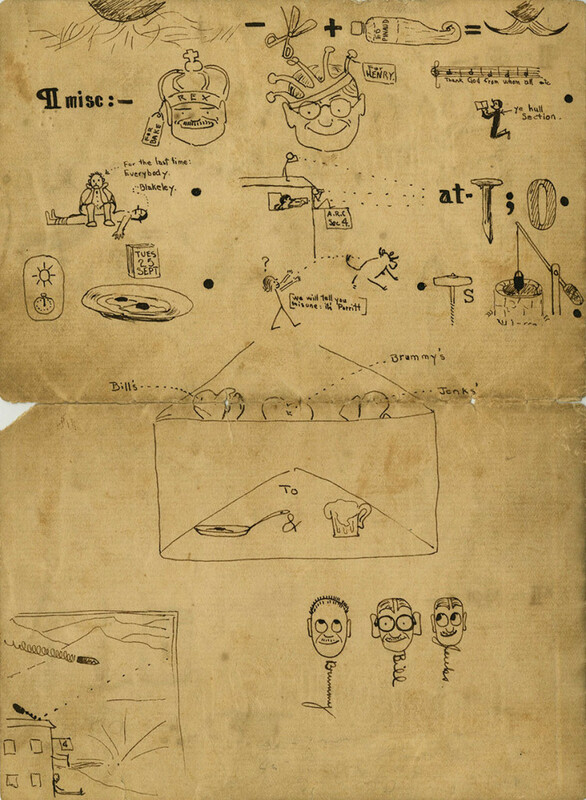 The top of the first sheet depicts someone pouring kerosene on what I assume to be a table or a grill, as does the bottom of the second sheet, where we see someone with the “fiammifero” or “lit match.” I assume the sketched lines coming out of the jug in the second drawing depict gas fumes. In both instances it looks like they are using the kerosene and fire to get rid of bugs (kerosene is commonly used as an insect repellent and it would make sense that they would want them away from somewhere they are cooking/eating). It also makes sense that they would first use kerosene, and when that failed, light the kerosene on fire (explaining the order of the 1st and 2nd pages). In the first sketch, it looks like the bugs just move on down to someone else’s table (the Simmy sign). Porritt may be Lieutenant Colonel Ernest Edward Porritt, who served in WWI (as a doctor, I believe). Spumante is a type of Italian sparkling wine, and I believe its depiction in a bowl indicated that they were drinking a punch that was popular back then made with fresh fruit or juice, rose wine, and Asti Spumante. It would have been served in a bowl, especially if made in a large quantity (which we can assume is exactly what they did)! Page order – I think the page displayed second should be read as the first page of the letter. That page begins by addressing the recipient(s) of the letter (“To Ag & Stein” maybe? – see second point) and possibly also giving a “From (indicated by the arrow) Jenks, Bill and Brummy right under it, gives a calendar for sorting out the dated events described in the letter, and labels which faces correspond to Brummy, Bill, and Jenks to make the pictogram easier to read. First paragraph about Brummy: On the night of Saturday, September 21, Brummy drank a variety of alcohols (including Asti Spumante, an Italian white wine that makes two appearances in this paragraph: as a bottle labeled “Asti” and in an overflowing bowl labeled “Spumanti”). Brummy was passed out by 11 pm, while the Corp (fellow ambulance driver Carlton Shaw), Jenks, and Jimmy were out carousing. By 1 am, Brummy was in bed and undressed with the help of everybody else. There seems to be a bowl of Asti Spumante by his bed – is that for continued drinking or an ironic receptacle for vomit? When Brummy woke the next morning (around 10 or 11 am), he had a bad hangover, and may have dirtied his bed linens in the night, so they were cleaned and hung out to dry. The bed itself was so bad that they had to pour kerosene on it and light it with a “fiammifero” (Italian for “match”). After drinking just water, Brummy was fine. Second paragraph (next page) about Jenks: Jenks’ bed was infested, so he doused it in kerosene (I know kerosene has been used to get rid of bed bugs, so that might make sense here). The bed bugs promptly migrated to Jimmy’s bed, allowing Jenks to sleep well. Jenks, Barney, and Henry drove an ambulance to Thiene, where they had tea (with a Brit, maybe? A Cheereo?). Tea!! Jenks and Barney got in trouble with “The Other Henry” for it, so Jenks swore they wouldn’t do it again. Tea for Jenks is now, as the well-known raven says, “Nevermore.” And then we have some “mules” or goats on mountains or something. The third paragraph about Bill: not sure – maybe some gastrointestinal problem that required surgery? And Captain Bates admonished Bill for untidiness? As continued on the next page, it looks like Bill used some Ed Pinaud mustache wax. I don’t have a clue about anything in the miscellaneous fourth paragraph. Obviously it’s more difficult because there isn’t a logical sequence of events. For the last two images, the idioms “throwing the bull” and “augurs well” do seem to be depicted. Of course, my mind immediately went to the bawdier “screws well” for the latter. Bill, Brummy, and Jenks send their love (symbolized by hearts, in various states of brokenness, in an envelope) to Ag and Stein. I agree with the suppositions already stated that this document was sent from the three pictured men (Brummy, Bill, Jenks) to Hemingway (The beer stein–an EH nickname was Stein). Do not know the meaning of the frying pan image with an egg. It appears that the three men are taking a train to Milan after saying farewell to Ambulance #2, #8,#13. I can’t decode the frying pan, pancakes, syrup, army rank (the bar and star), uniform with pants hung up(unless that reflects Hemingway’s leg wounds),the cemetery (which also might mean his narrow escape from death), and the bottle times 6. But following the introduction it appears that each paragraph sign and the re with the face refers to the activities of each man. The first one is Brummy who appears to have gotten very drunk on Sept 21st, to the point where he saw a rabbit. Everybody helped him into bed. On Sept 22nd he had a bad hangover, and perhaps was sick (sheets on the line with Everybody holding their noses) and eventually had to burn his bed/cot(?). Water seems to have helped him since the last cartoon has a wry smile. Next comes Jenks who had to treat his bed with kerosene to get rid of lice or fleas or bedbugs.Did the bugs go to Jimmy’s bed? Anyway Jenks appears to have a peaceful sleep. Jenks, Barney and Henry go to Thiene where they have a proper tea with jam and cream for the tea–a rarity in wartime! Do not know why they are on their knees to the other Henry or the meaning of the teapot and the raven–unless Jenks got sick from the tea and said “nevermore.” The final image of this section is Jenks having to drive an ambulance up a mountain only meant for mountain goats, clouds obscuring his vision. The final paragraph concerns Bill who, we know from Baker (48), had gastroenteritis. But it appears that they considered taking out his appendix–the images are the stomach and then the appendix in a jar and a scalpel with a question mark. The uniform (made by the Milan tailor Spagnolini,Baker 51) must have been demanded by Captain Bates, known for being strict and the high collar bothered Bill’s neck. And did Bill let his mustache grow? The last paragraph is labeled Miscellaneous and concerns an attack seen by American Red Cross Section 4 and then at the bottom it appears that the ARC #4 was hit by shells. I don’t know the reason for Bake and Henry in crowns or who Blakely is (who appears to be a casualty).Others have commented on throwing the bull. And the three broken hearts inserted in the envelope are touching! Hope any of these observations help. 2nd Lieu and silver being 1st) and a star indicates a citation. Thank you all so much for all of your comments so far on the Hemingway listserv and the blog! It’s amazing how much you have figured out already. I have compiled, arranged, and done minor edits on the ideas so far, so you can follow along with the document and help fill in the gaps. We appreciate all your help and hope you will continue deciphering this puzzle with us. Fiammifero is italian for a match,,the figure is lighting under the cook table with kerosene. I think the frying pan + stars = saint peter is referencing the big dipper and travel. Spumanti is sparkling wine and refers to the piss pot the drunken man had under his bed. Porrit I think is Perritt a surname. A few notes are appended to some paragraphs. This version includes some information in the paragraphs that probably should be relegated to notes. I attempted to use the same number of sentences as appear in the pictogram which results in several long sentences. Detailed notes for each part of the pictogram have been written but are not included here for the sake of brevity. A general background discussion also was prepared but is omitted here. 2. The hands on a clock inside a circle are used to show the hour. A “sun” is included in the circle to indicate daytime; absence of a “sun” indicates nighttime. Cross hatching also is used to show nighttime as are a moon and one or more stars. 3. Three black dots arranged in a triangle are interpreted to mean “therefore” (or something like “given the preceding, the following is the logical conclusion”). 4. Brummy is easily identified by his short, frizzy hair, like a burr haircut, whereas Jenks and Bill both part their hair in the middle. Bill is identified by his wearing of spectacles. 5. Most of the individuals depicted in the pictogram are members of Section IV of the American Red Cross Ambulance Service in Italy. Exceptions include; Captain Robert W. Bates, head of the ARC Ambulance Service in Italy; John W. Miller, Jr.; Agnes; Ruth Brooks; the “Rabbit”; and an Italian carabinieri. The date of the letter/pictogram is indicated by blacking out the date on the monthly calendar in the upper-right corner of the first page, presumably the date that the three men started to compose the pictogram: Tuesday, Sept. 24 (1918). Ruth “Brooksie” Brooks, an ARC nurse who is a known “party girl,” is somewhat arbitrarily chosen to be the ARC nurse depicted by pancakes (“stacked”) and syrup (“sweet”). Somewhat ironically, Brooks was given an assignment outside of Milan on the very day the three men started composing the pictogram, but, of course, the didn’t know that. The ribbon bar is depicted with a dark background (that would be dark blue on the actual robbon bar) with a (silver) star in the middle; this possibly represents John W. “Johnny” Miller, Jr., who was awarded a Silver Medal for Valor, as was Hemingway. Miller and Hemingway took leave together, leaving for Stresa on the same day as the date of the pictogram, Sept. 24th. In a Hemingway letter dated 11 November , reproduced in Spanier and Trogdon, Hemingway draws the ribbon bars for three medals, one of which is the Silver Medal for Valor (Medaglia d’Argento al Valor Militaire) His drawings for these medals are reproduced in the book. The drawing for the Silver Medal is quite similar to that appearing in this pictogram. Ribbon bars are worn above the left breast pocket of a military uniform. On Saturday night, Sept. 21st, Brummy (and others) drank mixed drinks made from Asti, Rum, Cognac (only last four letters are visible), Marsala, and Rock Syrup (water supersaturated with sugar) and enjoyed music and “ev’rything” (note the ditto marks). Later, at 11:00 pm, Brummy, holding a bottle, passed out outside the V.R. (Villa Rosa, or brothel), where he was attended and protected by a V.R. girl (“rabbit”); at the same time, Corp [Carleton Shaw, member of Section IV], Jenks, and Simmy [Zalmon K. Simmons, Jr., member of Section IV] were drinking, singing, and marching around — prancing like drum majors (Corp with a cane, Jenks with a bottle, and Simmy with a baton/stick); all of this activity was closely observed by an Italian carabinieri (national paramilitary policeman wearing a tricorn headgear) who was only slightly amused, if at all; at 1:00 am, Brummy was still in such bad shape that “everybody” had to help him to his bed where they pulled off his pants and got him ready for bed. During the night, Brummy was so sick that he filled his “chamber pot,” labeled Spumanti (“spew-manti”?) to overflowing (and he also soiled his sheets and bed). At 10:00 am, Sunday, Sept. 22nd, Brummy awakened with a horrible hangover, and could hardly open his eyes in the harsh daylight; everybody, holding their noses, hanged Brummy’s sheets outside on the clothesline to air out; Brummy’s bed/cot was so badly soiled that it was considered a total loss so everybody took it outside where two of them, still holding their noses, poured kerosene on it and set it afire using a “fiamifaro” (fiammifero, or wooden match). After drinking lots of water (a full pitcher? ), Brummy felt much better, was able to fully open his eyes, and even smiled. Jenks treated his bed with kerosene to get rid of bedbugs (or fleas), which promptly dove off his bed and migrated to Simmy’s bed. Jenks then slept soundly with a big smile. Jenks and Barney [Lawrence T. Barnett, member of Section IV] drove “Henry”, a Ford Model T ambulance (nicknamed “Henry,” probably after Henry Ford) to Thiene where they had tea, butter, and jam with a British person (who said “a cheerio” and wore a headgear that looked like a chef’s hat). They had real milk (or cream) in their tea!!. Henry (“the other Henry”) severely reprimanded Jenks and Barney for making their unauthorized trip to Thiene, shaking his fist while pointing to rules and regulations laid out on his desk; Jenks and Barney pleaded with Henry for leniency. Jenks swore off tea saying the w.k. (well-known) “nevermore” of Poe’s raven, but Barney only fumed (or whatever is indicated by lines radiating from the top of his head) and refused to make any promises (hand over mouth). Later, Jenks, wanting to get away from the Section IV barracks, or perhaps following orders, took an ambulance high up above the clouds of Mount Pasubio (characterized by a tunnel, of which there were 52, and caves, and a winding road, where his driving scared lots of mules (used as pack animals), many of which are depicted jumping from the mountain (undoubtedly an exaggeration but perhaps an indication that Jenks was driving fast), while other mules only stare in amazement or hide in caves. Jenks may plan to visit the cave with the sign “ABRI”, which in French means “shelter,” and perhaps refers to the soup kitchen on Mount Pasubio (mentioned by Carlos Baker, Life Story). Bill has been having lots of stomach pains. He wonders (indicated by the question mark) whether he needs to have surgery to remove his appendix. “Our Cap Bates” [Captain Robert W. Bates, head of the ARC Ambulance Service in Italy] saw that Bill had received a package in the mail from Spagnolini Brothers, tailors in Milan, that contained a new tailored English-style officer’s uniform; Cap Bates was not pleased and ordered Bill to follow regulations and wear the regular, regulation ARC Ambulance uniform; therefore, Bill wore the regulation uniform but he was very displeased and quite uncomfortable with the high, tight collar. (Bill’s displeasure and discomfort with the high collar are clearly depicted, with the tightness and height of the collar exaggerated for emphasis.) Bill’s mustache had grown too long and was unruly (first item on page three) so he trimmed it (minus sign) with scissors and added ([plus sign) Ed Pinaud’s wax, and the result (equal sign) was a beautiful mustache with waxed, turned-up ends. The “Henry” in this sentence undoubtedly is the same as “the other Henry” who reprimanded Jenks and Barney for making an unauthorized trip to Thiene. ‘Bake” is identified as 1st Lt. Edwin H. Baker, Jr., chef, or leader, of Section IV. The date that Baker replaced 1st Lt. Charles B. Griffin is uncertain but it certainly was before this pictogram was composed. “Henry” is identified as 2nd Lt. William H. “Henry” George, sous chef, or assistant leader, of Section IV. Interestingly, this “Bake” and Henry are the same as the persons mentioned in a Hemingway letter reproduced in Spanier and Trogdon (pp. 133-34) where Henry is misidentified as Henry S. Villard and “Bake” is simply identified as one of two Bakers who were associated with Section IV. An alternative interpretation of this sentence is that it makes fun of “ye hallway section” for treating “Bake” and Henry like they are royalty (thus symbolically presenting them with crowns) and acting worshipful toward them. In this alternative interpretation, “ye hallway section” represents a nickname for some subgroup of Section IV ambulance drivers who perhaps are being disparaged for their sycophantic behavior (aka “boot licking”). A third alternative is that “ye hallway section” may have put on a “play” (not a religious ceremony) where they presented Bake and Henry with (e.g.) paper crowns and showed their appreciation for the inspired and dedicated leadership of Bake and Henry displayed during the recently-ended “Battle of the Piave.” These alternative readings of the pictogram perhaps are suggested by the tags reading “For Bake” and “For Henry” attached to the crowns. Everyone is tired of always waiting for Blakeley [G. Bogert Blakeley, Section IV member from Bethlehem, PA], who presumably is always running late for every activity and task, so everybody, being “sick and tired” or always waiting for Blakeley decided that they’ve waited for Blakeley “for the last time.” Members of Section IV have been looking for (anticipating) an attack; so far, there has been no attack (indicated by big zero). At noon on Tuesday (actually Wednesday), Sept. 25th, they had fresh eggs for lunch (a treat always worth mentioning). Porritt [Longshaw K. Porritt, Section IV member from Hartford, CT] who in the past presumably has seemed quiet and weak, even “girlish,” as indicated by the long hair, seemed much improved at lunch and and was more outgoing and assertive, bragging and telling tall tales. It augurs well (is a good omen, for Porritt to be more outgoing and assertive). Drawings of Brummy, Jenks, and Bill, together with their names. A drawing of the Section IV building at the bottom left corner of page three is the equivalent of a “sender’s address” sometimes put at the end of a letter. The Section IV building served as Section IV headquarters and barracks and was located near Schio, Italy, not far from Mount Pasubio. Artillery shells are depicted flying through the air to indicate that this location is near the “war zone,” near the “front lines.” A skeleton is depicted slumped against the front of the building probably denoting that there is little activity at present and times are boring — or perhaps indicating the danger associated with their location. A few notes are appended to some paragraphs. Some information in the paragraphs that probably should be relegated to notes. I attempted to use the same number of sentences as appear in the pictogram which results in several long sentences. 6. This pictogram is being written soon after the Battle of the Piave and about one month before the coming, highly successful Italian offensive in late October (the Battle of Vittorio Veneto) which rapidly ended the war with Austria in early November, 1918. 2. Ruth “Brooksie” Brooks, an ARC nurse who is a known “party girl,” is somewhat arbitrarily chosen to be the ARC nurse depicted by pancakes (“stacked”) and syrup (“sweet”). She was one of the few ARC-Milan nurses other than Agnes who was young and attractive. Somewhat ironically, Brooks was given an assignment outside of Milan on the very day the three men started composing the pictogram, but, of course, they didn’t know that at the time. The ribbon bar is depicted with a dark background (that would be dark blue on the actual ribbon bar) with a (silver) star in the middle; this possibly represents John W. “Johnny” Miller, Jr., who was awarded a Silver Medal for Valor, as was Hemingway. Miller and Hemingway took leave together, leaving for Stresa on the same day as the date of the pictogram, Sept. 24th. In a Hemingway letter dated 11 November , reproduced in Spanier and Trogdon, Hemingway draws the ribbon bars for three medals, one of which is the Silver Medal for Valor (Medaglia d’Argento al Valor Militaire) His drawings for these medals are reproduced in the book. The drawing for the Silver Medal is quite similar to that appearing in this pictogram. Ribbon bars are worn above the left breast pocket of a military uniform. On Saturday night, Sept. 21st, Brummy (and others) drank mixed drinks made from Asti, Rum, Cognac (only last four letters -GNAC- are visible), Marsala, and Rock Syrup (water supersaturated with sugar) and enjoyed music and “ev’rything” (note the ditto marks). Later, at 11:00 pm, Brummy, holding a bottle, passed out outside the V.R. (Villa Rosa, or brothel), where he was attended and protected by a V.R. girl (“rabbit”); at the same time, Corp [Carleton Shaw, member of Section IV], Jenks, and Simmy [Zalmon K. Simmons, Jr., member of Section IV] were drinking, singing, and marching around — prancing like drum majors (Corp with a cane, Jenks with a bottle, and Simmy with a baton/stick); all of this activity was closely observed by an Italian carabinieri (national paramilitary policeman wearing a tricorn headgear) who was only slightly amused, if at all; at 1:00 am, Brummy was still in such bad shape that “everybody” had to help him to his bed where they pulled off his pants and got him ready for bed. During the night, Brummy was so sick that he filled his “chamber pot,” labeled Spumanti (“spew-manti”?) to overflowing (and he also soiled his sheets and bed). At 10:00 am, Sunday, Sept. 22nd, Brummy awakened with a horrible hangover, and could hardly open his eyes in the harsh daylight; everybody, holding their noses, hanged Brummy’s sheets outside on the clothesline to air out; Brummy’s bed/cot was so badly soiled that it was considered a total loss so everybody took it outside where two of them, still holding their noses, poured kerosene on it and set it afire using a “fiamifaro” (fiammifero, or wooden match). After drinking lots of water (a full pitcher? ), Brummy felt much better, was able to fully open his eyes, and even smiled. Notes: It appears that two cots are being burned, one upside down on the other, or perhaps a single cot folded over in some way. The specific bottles of alcoholic drinks suggest that various mixed drinks were made. Jenks treated his bed with kerosene to get rid of bedbugs, which promptly dove off his bed and migrated to Simmy’s bed. Jenks then slept soundly with a big smile. Jenks and Barney [Lawrence T. Barnett, member of Section IV] drove “Henry”, a Ford Model T ambulance (nicknamed “Henry,” probably after Henry Ford) to Thiene where they had tea, butter, and jam with a British person (who said “a cheerio” and wore a headgear that looked like a chef’s hat). They had real milk (or cream) in their tea!!. Henry (“the other Henry”) severely reprimanded Jenks and Barney for making their unauthorized trip to Thiene, shaking his fist while pointing to rules and regulations laid out on his desk; Jenks and Barney pleaded with Henry for leniency. Jenks swore off tea saying the w.k. (well-known) “nevermore” of Poe’s raven, but Barney only fumed (or whatever is indicated by lines radiating from the top of his head) and refused to make any promises (hand over mouth). Later, Jenks, wanting to get away from the Section IV barracks, or perhaps following orders, took an ambulance high up above the clouds of Mount Pasubio (characterized by a tunnel, of which there were 52, and caves, and a winding road, where his driving scared lots of mules (used as pack animals), many of which are depicted jumping from the mountain (undoubtedly an exaggeration but perhaps an indication that Jenks was driving fast and/or reckelssly), while other mules only stare in amazement or hide in caves. Jenks may plan to visit the cave with the sign “ABRI”, which in French means “shelter,” which was used by Brumback who had served in American Field Service in France. (This shelter perhaps refers to the soup kitchen on Mount Pasubio mentioned by Carlos Baker, Life Story). 1. The “Henry” in this sentence undoubtedly is the same as “the other Henry” who reprimanded Jenks and Barney for making an unauthorized trip to Thiene. 2. “Bake” is identified as 1st Lt. Edwin H. Baker, Jr., chef, or chief, of Section IV. Baker replaced 1st Lt. Charles B. Griffin at the end of July or early August, 1918. “Henry” is tentatively identified as 2nd Lt. William H. “Henry” George, sous chef, or assistant chief, of Section IV. Interestingly, this “Bake” and Henry are the same as the persons mentioned in a Hemingway letter reproduced in Spanier and Trogdon (pp. 137-138) where Henry is misidentified as Henry S. Villard and “Bake” is simply identified as one of two Bakers who were associated with Section IV. This letter probably was written after the armistice in November, 1918. 3. An alternative interpretation of this sentence is that it makes fun of “ye hall section” for treating “Bake” and Henry like they are royalty (thus symbolically presenting them with crowns) and acting worshipful toward them. In this alternative interpretation, “ye hall section” represents a nickname for some subgroup of Section IV ambulance drivers who perhaps are being disparaged for their sycophantic behavior (aka “boot licking”). A third alternative is that “ye hall section” may have put on a “play” (not a religious ceremony) where they presented Bake and Henry with (e.g.) paper crowns and showed their appreciation for the inspired and dedicated leadership of Bake and Henry displayed during the recently-ended “Battle of the Piave.” These alternative readings of the pictogram perhaps are suggested by the tags reading “For Bake” and “For Henry” attached to the crowns. Everyone is tired of always waiting for Blakeley [G. Bogert Blakeley, Section IV member from Bethlehem, PA], who presumably is always running late for every activity and task, so everybody, being “sick and tired” or always waiting for Blakeley decided that they’ve waited for Blakeley “for the last time.” Members of Section IV have been looking for (anticipating) an attack; so far, there has been no attack (indicated by big zero). At noon on Tuesday (actually Wednesday), Sept. 25th, they had fresh eggs for lunch (a treat always worth mentioning). Porritt [Longshaw K. Porritt, Section IV member from Hartford, CT] who in the past presumably has seemed overly quiet, seemed much improved at lunch and and was more outgoing and assertive, bragging and telling tall tales. It augurs well (is a good omen, for Porritt to be more outgoing and assertive). 1. The interpretation of the Blakeley sentence assumes that “to sit on” is slang for “to wait for.” This interpretation is based partially on “everybody” being drawn with a dejected appearance, looking like someone who is bored and tired of waiting. 2. The interpretation of the Porritt sentence assumes that “to throw a bull” or “to throw bull” is slang for bragging or boasting, possibly including telling tall tales of ones accomplishments and also is interpreted as Porritt showing a more outgoing, assertive attitude. (What else could “augur well”?) It is not clear why Porritt is depicted with long hair; maybe he had been acting like a sissy (???). This hardly seems likely because Porritt served with the American Field Service in France and then volunteered for ambulance work in Italy.